1.In large skillet, add dill sprigs, lemon slices, 2 cups water, wine and 2 teaspoons salt; cover and heat to boiling over high heat. Add salmon, skin side down, to skillet. Cover and cook 7 to 9 minutes or until salmon turns almost opaque throughout and reaches an internal temperature of 145°. Remove salmon from skillet and pat dry with paper towels; remove skin, if desired. 2.Meanwhile, in small bowl, stir mayonnaise, herbs, sour cream, lemon juice and zest, pepper and remaining 1 tablespoon water and 1/4 teaspoon salt. Serve salmon with sauce garnished with lemon slices and herbs, if desired. Creamy Herb Sauce can be prepared up to 3 days in advance and refrigerated. 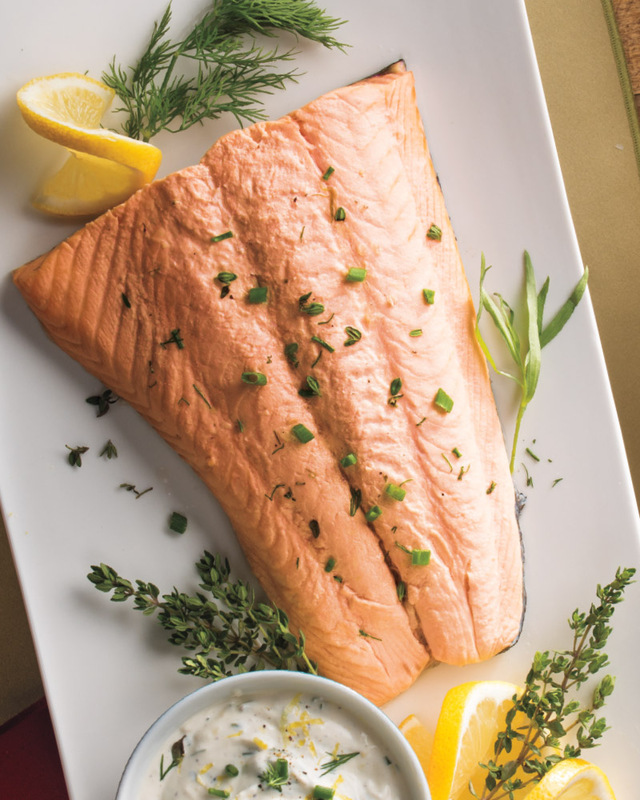 Salmon can be poached up to 1 day in advance, refrigerated and served chilled. > The American Heart Association recommends eating fish (particularly fatty fish) at least two times (two servings) a week.